Montezuma Castle is one of a number of well-preserved ancient dwellings in north central Arizona, including the Wupatki, Tonto, Walnut Canyon, and Tuzigoot national monuments. 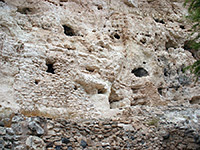 It is probably the most spectacular; an imposing 20 room, 5-story structure built into a recess in a white limestone cliff about 70 feet above the ground. 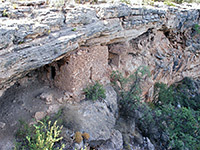 When first (re)discovered the ruins were thought to be Aztec in origin, hence the name bestowed on them by early explorers, but they are now known to belong to the Sinagua Indian peoples who farmed the surrounding land between the twelfth and fourteenth centuries, before abandoning the area. The good state of preservation of the ruins is due in part to their protected location, shielded from rain and sun, and also the relatively early designation of the site as a national monument (in 1906). The castle is located just two miles from I-17 (exit 289; north Camp Verde - see map) at the end of a side road that winds across flat scrubland and down into the wooded valley formed by Beaver Creek - a small stream, but a reliable source of water all year round and hence a good locality for the Sinagua to establish a home. The national monument has a visitor center with a small museum and bookstore, from where a short paved nature trail leads past the ruins, which are not visible from the approach road, then loops back alongside the creek. About 50 feet west of the main ruin is a much less well preserved complex named Castle B, consisting of a few rudimentary rooms also on several levels. The land surrounding the path is semi-cultivated, planted with good examples of cacti and other local plants. There is a picnic site near the visitor center, in the shade of large sycamore trees overlooking the creek. Since 1951, visitors have not been permitted to climb up to the ruins due to their unstable condition so there is not much to do other than walk the loop trail and take a few photographs but the site is definitely worth a visit. Exploration away from the path is not permitted. 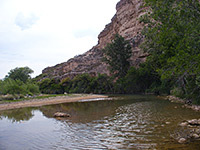 A separate part of Montezuma Castle National Monument lies seven miles northeast - Montezuma Well is a flooded limestone sink hole 55 feet deep formed by the collapse of a large underground cavern. Admission to the well is free, though the fee for the main site (2019) is $10 per adult, also covering entry to Tuzigoot National Monument. The well is reached from exit 293 of I-17, along a winding route through scattered dwellings that becomes unpaved at the side road to the monument, then passes a picnic area and foundations of a Hohokam pit house, now protected by an iron roof, before ending at a carpark and small cabin with rangers in attendance. 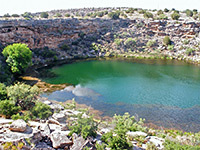 The water level in the well is maintained year-round by underground springs and so the lake was an obvious place for the local Indians to live near, as evident from various ruins scattered around the area, and remnants of an ancient irrigation system. From the carpark a half mile loop trail leads first to the south edge of the well and down to the waters edge, which is a good place to observe the Sonoran mud turtles (currently under threat from an invasion of non-native red eared turtles) that inhabit the greenish pool. Under the cliff edge the Sinagua built several stone cliff dwellings, some quite well preserved, while the surrounding rim has other sites that now are just jumbled piles of stones. The path continues across a plateau and down to the exit channel of the well, where water emerges from the base of a limestone cliff and flows down a short ditch lined with white-barked Arizona sycamore trees before joining the permanent stream of Wet Beaver Creek. As with Montezuma Castle, the well does not take long to explore yet is a worthy stop. One compositional note; the lake is just too large to photograph all of it without a wide-angle lens, or merging of two separate images. PDF format area map for Montezuma Castle National Monument, from the National Park Service (764 kb).